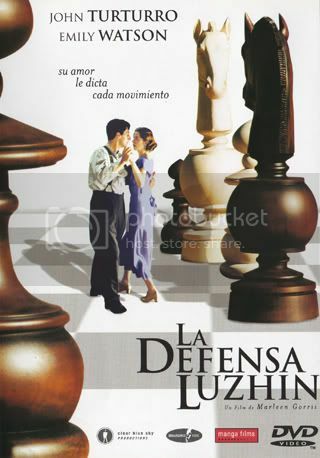 The Luzhin Defence is a 2000 movie starring John Turturro and Emily Watson and was directed by Dutch director Marleen Gorris. The film centres around a mentally-tormented chess grandmaster and the young woman he meets while competing at a world-class tournament in Italy. THE LUZHIN DEFENSE is an adaptation of the Vladimir Nabokov novel shot by the Dutch director Marleen Gorris (Antonia's Line) in 2000. It's the early 1920s and Aleksandr Ivanovich 'Sascha' Luzhin (Turturro), a gifted but tormented chess player, arrives in a Northern Italian city to compete in an international chess competition. Prior to the tournament he meets Natalia Katkov (Watson) and he falls in love with her almost immediately. She in turn finds his manner to be appealing and they begin to see each other in spite of her mother's disapproval. A solitary and eccentric man, Luzhin lives only for the chess game, until the day he meets Natalia Katkov, a young Russian woman who's spending her holiday with her mother in the same resort. Despite her mother's advice, Natalia accepts Luzhin's advances and falls in love with him. The Russian master defeats his first adversaries and enjoys happiness for the first time in his life. He must now face the Italian world champion who has hired Leo Valentinov, Luzhin's former impresario, in order to unhinge the Russian genius. Stressed by the events, Luzhin undergoes a nervous breakdown after the first day and is asked by his doctor to give up chess if he wants to live a long life. Natalia takes care of him although her parents strongly disapprove her forthcoming marriage with Luzhin. She also must protect him from Valentinov who has not given up the idea to talk Luzhin into finishing his match with his Italian adversary. Competing alongside Luzhin in the championship is Dottore Salvatore Turati (Fabio Sartor), who is approached by Leo Valentinov (Stuart Wilson), a Russian, who is Luzhin's former chess tutor from pre-revolutionary Russia. Valentinov tells the Italian that Luzhin cannot handle pressure and he intimates he will make sure that his former prodigy will be unsettled off-table giving Turati a winning chance. The competition starts badly for Luzhin who is unsettled by the presence of his former friend and coach. He struggles through the early rounds but he soon begins to win again as his relationship with Katkov becomes closer and intimate. She then informs her parents that she is going to marry him. Meanwhile Luzhin goes onto reach the final and face Turati. But in the finals the Russian Émigré loses out to the time clock, forcing the game to adjourn. However, outside the venue, he is whisked away by an accomplice of Valentinov who abandons him in the countryside. His former teacher knows that this will completely unhinge him because of the memory of his parents' abandonment many years ago. Luzhin wanders aimlessly until he collapses and is found by a group of Blackshirts. Luzhin is taken to the hospital suffering from complete mental exhaustion. The doctor informs Katkov that he will die if he keeps playing chess as he is addicted to the game and it's consuming his very being. Nevertheless even while recuperating Valentinov comes around with a chess board encouraging Luzhin to finish the match with the Italian, Turati. Eventually Luzhin leaves the hospital. He and Natalia then agree to marry at the earliest opportunity. However on the morning of the wedding, Luzhin is put into a car with Valentinov, who tells him that there is the small matter of finishing the competition. In terror, Luzhin leaps from the car. Dazed, cut and mentally confused, he stumbles back to the hotel where he tries to dig up a glass chess piece in the grounds, one which he buried years ago, but he does not find it. Luzhin, who is in his muddied wedding suit, sits in his room as Natalia and the hotel staff try to open the door. But before they can get in, the troubled chess grandmaster throws himself out of his bedroom window and dies. The tragic death is witnessed by Valentinov who has just arrived by car. The film then concludes in the competition hall where Natalia completes the competition using her fiance's notes. Turati does exactly what Luzhin expected and loses. Katkov and Turati then leave acknowledging the Pyrrhic victory and the genius of Luzhin. The Luzhin Defence traces the fine lines that exist between passion, obsession, devotion and madness. Like the madness it portrays, the movie takes some time to peak and then everything goes to pieces at once. While the rising action is beautifully laid out and the climax is tragic, it is the film’s conclusion that finally won me over to The Luzhin Defence. Watson’s portrayal of Natalia is nearly flawless — the film is worth watching just for her performance — and it is through her that the audience is drawn into the action. She knows nothing of chess and yet she throws her full support behind the eccentric Luzhin. The return of his former mentor in the midst of the climactic tournament causes Luzhin considerable stress and puts him off his game. While the tournament scenes will appeal to chess fans, they are limited in number and duration (which non-chess fans will appreciate) as the ultimate focus of the film is the romance between Alexander and Natalia. Nabokov based The Defense on the life of German chess master Curt von Bardeleben who committed suicide by leaping from a window in 1924. The film was shot entirely on location in Europe. Budapest, Hungary was used for outdoor scenes set in St Petersburg, these included the Széchenyi Chain Bridge, Hungarian National Museum and Heroes' Square. The chess tournament (although in Italy) was shot inside the main hall of Museum of Ethnography, Budapest. In Italy, the hotel scenes were filmed at The Bergamo, Lombardia, and Lake Como. The novel plays out almost entirely in the mind of Alexander Luzhin (John Turturro), a shabby prodigy so focused on the 64 square grid that the real world fades into shadow. The movie, by contrast, homes in on Luzhin's fiancée (Emily Watson), who struggles for control of her near autistic knight in a larger game against his malignant former tutor (Stuart Wilson). it's mainly talking of habits which becocome part of our life . we are connected and addicted to habits of our everyday life. it's hard to change them. Luzhin is an example of chess addiction but there are other habits we are sticked to them everyday, death of a lover, love, reading, shopping, working,... and we are afraid that if one day we lose thm so then we can't continue. it's just like the story of a glass in your hand for more than 3 hours. nothing happens but you get tired.